Long time ago, the only way people can invest was by investing in stocks. However, not everybody had the expertise to pick stocks. Moreover, most people were busy working. So, they did not have time to monitor their stocks. As a result, stock picking was based on rumors, hearsay. When times were good, investors borrow money (leverage) to invest more thinking that the stock market would continue to go up. Of course, that came to a sad ending and many lost their entire fortune investing in stocks because they overleveraged. The Asian financial crisis in 1997 (also known as the tom yum effect because it started from Thailand), the 1998 CLOB fiasco, 2001 dot.com bubble are examples which stock picking ended catastrophically. Then one day, someone invented mutual funds. Actually, mutual funds were invented long ago but it only became popular not too long ago (less than 2 decades ago). In this part of the world, it is called unit trusts. By investing in unit trust, the investor outsources and hires professional fund managers to pick stocks. The benefit of unit trust is diversification both in terms of the number of securities and asset classes. Through unit trusts, the investor can invest in any almost any part of the world which previously was not possible through direct stock investment. However, it appeared that unit trusts failed to deliver. 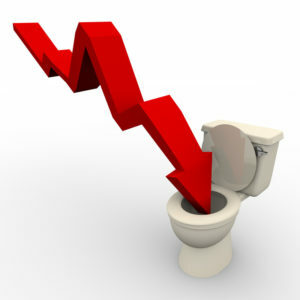 Common complains are high fees and poor performance. But what was made worst was that investors were actually trying to time the market using unit trusts. I remember reading in an old forum about this individual who calculated the “momentum” of each unit trusts and invest in the one that has the highest momentum. I also know of others who uses technical analysis to determine when to buy and sell unit trusts. Banks were also notorious in selling unit trusts based on the ‘favor’ of the month similar to rumors and hearsays. As a result, investors’ returns were worst than the returns of the unit trust itself. Selecting unit trusts became so confusing that financial advisers were hired to select unit trusts on behalf of their clients. In Singapore, investors who do not have the experience nor knowledge in investing in unit trusts must hire a financial adviser. So we ended up a situation in which investors have to hire a professional to pick professional fund managers. But there is a problem, the professional fund manager picker isn’t very professional. Typically, unit trusts are emended within an insurance product called investment-linked policy with 4 layers of fees and the asset allocation usually look something like 50% China, 50% India. Why? Because they were taught by their uplines that these two countries have very good past performance. Recently, two companies offer an interesting service for financial advisers. Professional financial advisers like me can hire another professional to pick professional fund managers. I am getting a headache… Ouch! In the meantime, people started to realized that index funds like Exchange Traded Funds (ETFs) offer better returns mainly because of its low fees. Huge amount of money from all over the world was poured into ETFs. But wait, there is one problem. There are now too many ETFs to choose from because all kinds of ETFs were developed! There are now more than 4000 ETFs in the world. I read about a guy who lost all his US$4 million in just one day. Apparently, the entire portfolio was invested in XIV, an Exchange Traded Note that short VIX. XIV made a lost of 96.3% of its value on 5 Feb 2018 (Monday) and the fund house has decided to close it down. Opps. What could be the reason why an investor would put all the money into just one security? I guess it is because past returns were very good. In the past few years, volatility has been low and by shorting it, one would make money if the volatility continues to come down. On 5 February 2018 Monday, there was an outflow of US$4.1 billion from ETFs listed in the US. For those who were living in the cave, the Dow Jones dropped 4.6% in just a single day. The fact that there was huge amount of money that flow out of ETFs showed that investors tend to sell low. Actually, there are evidence to show that investors always sell low and buy high. Back to the part on financial advisers. In response to the observations that financial advisers are not necessary that competent, the FinTech industry introduced robo advisory to help investors with their investments. The beauty of these robots is that they have no emotion. So they will not make stupid human mistakes. Unfortunately, the humans investors continue to make the silly human mistakes. There was an article I read: Fidelity Reports Web Issues After Robo-Adviser Sites Crash which stated that the websites of serveral robo advisory services providers like Fidelity, Wealthfront, Betterment and Vanguard faced technical issues because many investors were worried and were trying to login into their accounts due to the Monday crash. I found this really very weird. What is there to worry if investors have decided to hire professionals (in this case a robot) to look after their portfolios? Despite being advised by the robot it is unwise to sell, he or she proceeded to sell. 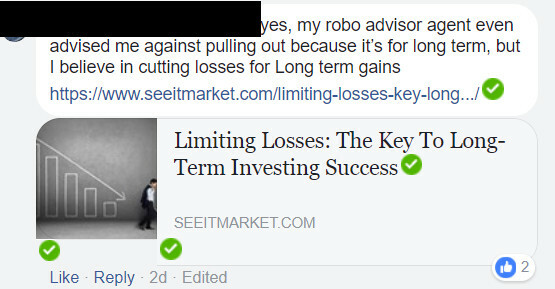 The link the above facebook user used to justify the importance of limiting losses can be found here: https://www.seeitmarket.com/limiting-losses-key-long-term-investing-success-15570/ I expected to read an academic paper but I only found an article written by a novice investor. The article demonstrated the importance of limiting losses by showing what happens if you could avoid bear market by running some numbers known as backtesting. The author backtested his simple portfolio by fullly invested when times are good and reduce exposure to equity when times are bad. But nobody invests based on hindsight. Nobody drives by looking at the rearview mirror. The problem is that it is impossible to know when the bad and good times are coming unless it come to past. Hindsight investing can never work: you cannot win TOTO based on yesterday’s winning numbers. Many investors invest based on rumors and hearsays similar to stock pickers of yesteryears. Many financial advisers advice based on favor of the month which is similar to rumors and hearsays. This is especially so in the banks. There are just too many confusing unit trusts. There are just too many confusing ETFs. Many investors are trend followers: buy when market goes up and sell when markets go down. Investors do not listen to professional advisers (humans and robots). Investors like to listen to articles that imply it is possible to strike TOTO based on yesterday’s winning TOTO number (i.e. investment strategy that works perfectly when backtested). Hi, it is common knowledge that when one purchase stocks of a company and the company goes bankrupt, we will lose all our money. However in the case of ETF [especially the 2 most common; SPDR STI ETF (ES3) and NIKKO AM STI ETF (G3B)], if the fund houses collapse or decide to close down the ETF, does investor actually gets nothing back? Appreciate if you can elaborate a bit on this cause I believe I’ve read somewhere that investors of these ETFs are “protected”. Thanks in advance for the sharing. It depends on how the fund is structured. If it is structured as a trust, the beneficiaries of the trust are ultimate owners and will not lose the underlying assets despite the bankruptcy of the trustee. If the fund is structured as a note, investors are actually creditors and may potentially lose some or all their money in the event the issuer becomes insolvent. But sometimes, it is not obvious that investors are actually ‘investing’ in a single company despite the appearance of investing in a fund. Example, many investors bought MiniBonds in the 2007-2008. While MiniBonds had the appearance of investing in a few companies’ bonds, in reality, investors were actually expose to the full credit risk of Lehman brothers. Thus, in a sense they were actually buying a single bond from Lehman brothers. Many blogs and even some newspaper are repeating the common knowledge of ETFs but missed out this critical piece of the puzzle. Care to comment on the two? Read their prospectuses. They will tell you. If after reading still not sure, then email your questions to the 2 sponsoring companies. Same concept as for UT, mutual fund, ILP, CEF and any other CIS. Just beware of how the exchange traded product is structured … whether physical replication of underlying shares or synthetic using derivatives. Synthetic products such as XIV (the ETN in which the famous speculator lost US$4M) can blow up due to counter-party risk, breach of covenants, strike prices, expiration dates, rollover contango, etc. Structured deposits like Minibonds, Pinnacle Notes, DBS High Notes, etc contain synthetic elements of the above … hence during 3-sigma or 4-sigma black swan events, they can easily blow up. The irony is that many of the underlying actual physical MBS & ABS in the above structured deposits bought over/taken over by “vulture” investors still had value & many recovered 50% to 80% of their value over the years. Unfortunately structured deposits are created without the luxury of time or holding power to ride out years of unexpectedly bad asset devaluations. Although to be sure, Fama is still a die-hard exponent of EMH. The problem (or trick) of using momentum & trend following successfully is the actual implementation or mechanics, which can be quite different for different asset classes & investment vehicles, as well as the age-old investors’ enemy — themselves i.e. discipline & emotion.